The word “authentic” is often overused in restaurants when referencing cuisine. If you’ve ever traveled to Europe, especially Italy, then you probably have a good idea of what authentic food is all about. Chefs that specialize in Italian cuisine don’t always have the luxury of having grown up in the mother country, so they have to draw on their childhood kitchen experiences for inspiration and influence. Such is the case with 200 East Supper Club‘s executive chef Tony Navarro. The 200 East Supper Club is located on the main level of the historic Seneca Hotel. It’s a moderately-priced, business-casual spot that features live entertainment Tuesday through Saturday. The ambiance feels somewhat old school, with a splashes of elegant touches sprinkled throughout the main dining room. Hugo’s Frog Bar Now Open For Lunch! In an effort to further my big-city experience, I decided to check out the Gold Coast neighborhood, where the nightlife is rich and the men are richer — and older. The area is jam-packed with people, fancy cars and Fendi handbags. All of my disclosed jealousy made me hungry, so me and a couple fellow street teamers “jumped” over to Hugo’s Frog Bar. While this place is usually “hopping” (OK, I’ll stop with the frog analogies) when the sun sets on Rush Street, it is now open for lunch! We sat at an outside table (the sea captain digs inside isn’t really my scene), and it was a prime people-watching location. Granted, one should focus on their food during mealtime, but this neighborhood has such a unique crowd that you just can’t help yourself. Ever wonder why it’s called a “frog” bar? Apparently, “Frog” was the nickname Hugo Ralli (one of the owners) called his grandfather, General Bruce Hay of Her Majesty’s Imperial Forces, which explains the ship-like decor. For starters, we had the crabmeat avocado. It was like a small crabmeat casserole topped with avocado slices. While I’m no professional food critic, I thought it was delicious. You can eat it alone or have it as dip with the great assortment of complimentary bread. However, I must warn you, although the serving looks small, it will certainly fill you up. We all ordered different things, from the seared halibut to the garbage salad. There were no complaints among us and the service was magnifique! I went for the lobster roll/sandwich/huge mouthful of seafood. Even though I struggled to get a handle on it at first, it was completely worth it. I definitely recommend this place. The lunch menu is reasonably priced, considering the good selection of seafood and the food is great. I’ll have to check this place out for dinner when night falls, but until then, you can find me people-watching from my intern desk. Until next time! Chocolate, Chocolate, Chocolate Around Chicago! Almost everyone loves chocolate, or at least crave a little a bit of chocolate every now and then. Although I’m not a huge connoisseur of chocolate, I do partake in nibbling when I get that “chocolate feeling”. However, for some, chocolate means a little more than just a nibble here or a bite there. In-fact, for Chicago native Valerie Beck, chocolate is her passion and Chicago Chocolate Tours is her creation. 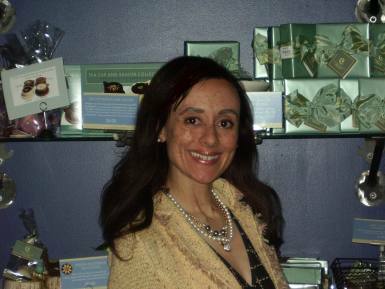 A Harvard College and Harvard Law School grad, Valerie founded Chicago Chocolate Tours in late 2005. She lived in Europe for 5 years, sampling her way through the chocolate shops of the continent. Back home in Chicago, she used to sneak out from her law firm for a daily chocolate fix, and one day she didn’t come back. She realized that there was an incredibly vibrant chocolate community right outside her door, and she set out to link members of that community, and members of the chocolate-loving world. What happens on a Chicago Chocolate Tour? You’ll be escorted by a lively and knowledgeable tour guide on a fun and fascinating walking tour to a variety of chocolate shops, where you’ll sample the specialties of the house and meet the chocolatier, owner, or manager, for a behind-the-scenes talk about what makes the chocolate unique. You’ll also learn about the history and health benefits of chocolate, and about the special role of chocolate in Chicago and on the world timeline. Test your chocolate knowledge in their “choc quizzes” along the way, and find out whether chocolate has caffeine, why 18th century doctors prescribed chocolate to women, or whether chocolate is really an aphrodisiac! Where will you go on a Chicago Chocolate Tour? Choose one of four routes in different neighborhoods – the Magnificent Mile, Gold Coast, Downtown Loop, or Andersonville – and experience six wonderful chocolate shops or bakeries on each route. Depending on the route, you’ll experience chocolate shops from famous favorites to hidden treasures, and from big brands to small often women-owned chocolate boutiques. How much chocolate is there on a Chicago Chocolate Tour? More than you can finish! They will ply you with so many treats, from truffles to tortes to tasty cocoa beverages, that most people can’t finish it all. They will give you a goody bag to take the rest home, so that you can keep enjoying the tour the next day. When you take a Chicago Chocolate Tour, you help save the world. For real! In addition to providing you with a one-of-a-kind experience involving scrumptious chocolates, education, camaraderie, and fun, Chicago Chocolate Tours donates a portion of proceeds to CARE (www.care.org), an international humanitarian organization that helps women around the world exit poverty through entrepreneurship.The cost of the tour is $40 per person. Choose a private tour for a group of friends or clients, make a private tour part of your bachelorette party or birthday party, or take a public tour and make new chocolate friends.